‘Our final chance to fight for our future’. 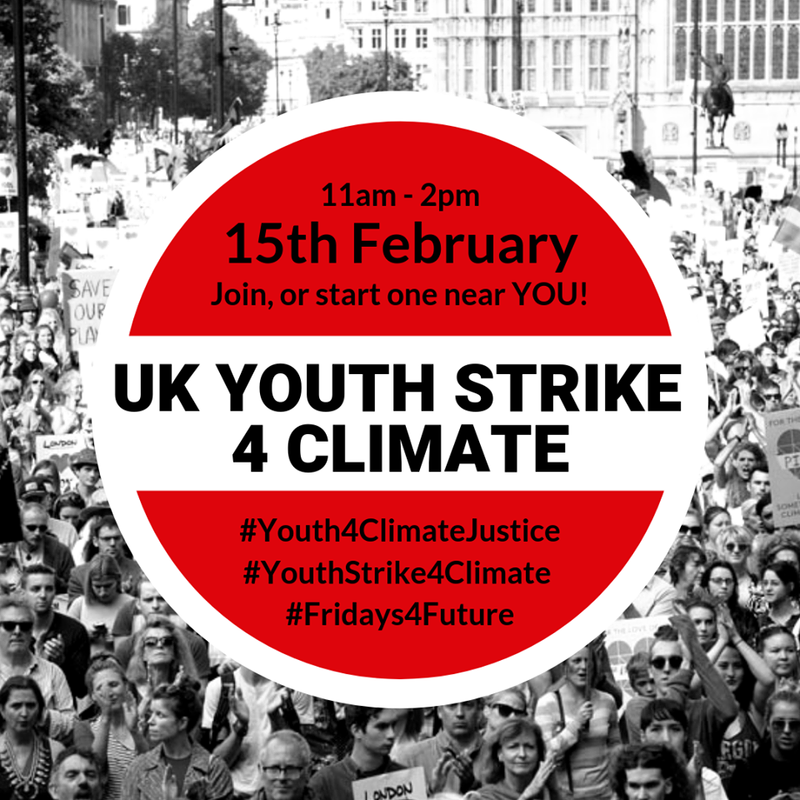 On Friday 15 February students across the UK will be striking to protest the lack of government action being taken to combat the climate crisis. School students in more than 38 locations across the UK have confirmed they are planning action and thousands are expected to participate. The UK Student Climate Network (UKSCN) is a group of under-18s taking to the streets – partnering with many groups to create a movement of students to send a message that they are tired of being ignored. With 200 species going extinct every day and water scarcity affecting up to 360 million people, we are all, they point out, already facing devastating and irreversible impacts around the world. This, they say, is their final chance to fight for their future. The students have four main demands. Demand 1: That the government declare a climate emergency and prioritise the protection of life on Earth, taking active steps to achieve climate justice. Demand 2: That the national curriculum is reformed to address the ecological crisis as an educational priority. Demand 3: That the government communicates the severity of the ecological crisis and the necessity to act now to the general public. Demand 4: The government recognises that young people have the biggest stake in our future, by incorporating youth views into policy making and bringing the voting age down to 16. The UK Student Climate Network was set up by a small group of volunteers who were inspired by the powerful and direct protests made by young people against climate inaction across the rest of Europe. The UK Student Climate Network draws a lot of inspiration from the ideas and campaigning of Swedish 16 year-old climate activist Greta Thunberg. The movement she founded, Fridays for Future, refers to how she strikes every Friday to protest the lack of effective climate legislation on a governmental level. On 20 August 2018, after heat waves and wildfires in Sweden, Thunberg, then in ninth grade, decided to not attend school until Sweden’s general election – on 9 September 2018. She called for the Swedish government to reduce carbon emissions as per the Paris Agreement, and she protested their inaction by sitting outside the national parliament every day during school hours with a sign saying ‘Skolstrejk för klimatet’ – School Strike for the Climate. Her protest was inspired by US school students who staged walk-outs to demand better gun controls in the wake of school shootings. She continued to strike after the general election – but only on Fridays. This gained worldwide attention and has inspired school students across the globe to take part in student strikes. In the UK a small group of school students braved the rain in London to rally outside Downing Street on Friday 7 December, just a few days after Thunberg made a historic speech to the UN Secretary General. And Ellida Dilley, 15, and in year 10 at the Corsham School, was one of around four students who took the strike action on the last day of last term. As of December 2018, more than 20,000 students worldwide have held strikes in at least 270 cities. Click here for a step-by-step guide on how you can join or support #FridaysforFuture. Follow Youth Strike 4 Climate on Twitter.